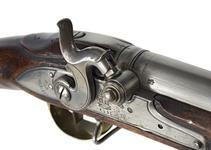 Percussion muzzle-loading musket - Pattern 1839? Converted from a very late India Pattern flint-lock, the lock-plate bearing the cypher of Queen Victoria and TOWER. These converted arms were known as Pattern 1839? 1838?